These are more than just a PLC, they include a Graphical Operator Interface (HMI), built-in I/O, networking and removable mass data storage. OCS is a robust, reliable control product that combines a traditional controller (programmed with ladder logic) with an operator interface, I/O and networking into an integrated, all-in-one unit using a single industry-recognised software package called CscapeTM. --- The HE-XE series has a 128x64 graphical display and a 20-key keypad with 10 function keys and four "soft keys" which can be programmed differently for every user screen. --- The HE-XT series features a 160x128 touchscreen graphical display with 4 function keys. Please note: All of the PLCs require the Cscape software (free download) and HE500CBL300 programming cable. Programming cable is also included in HE-CSP100-4 package. Programmable Logic Controller XLe Series OCS: All models have a PLC, operator interface, networking and I/O built-in. Controller has 256 KB of application memory and 1.2 mS/K logic scan. Operator interface features a 128 x 64 graphical display and 20-key keypad with function key and numeric entry capability. Programmable Logic Controller XLt Series OCS: All models have a PLC, operator interface, networking and I/O built-in. Controller has 256 KB of application memory and 1.2 mS/K logic scan. 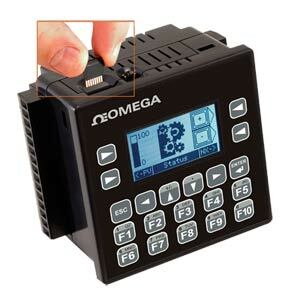 Operator interface features a 160 x 128 sunlight readable graphics display via a high resolution resistive touch screen, 4 function keys and a system key. Notas: Panel-mount hardware and user manual included. Signal50 Warning Tower Lights and Sirens. 50mm Dia.